I’ve received multiple reports that this location has closed. This seems to be the case as it is no longer listed on the locations page of their website. 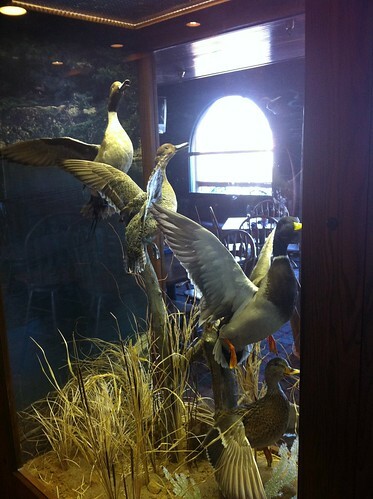 I had heard a little bit about this outdoor-themed family restaurant but still did not know exactly what to expect when I took the trip up north to I-35 and NE Antioch road. 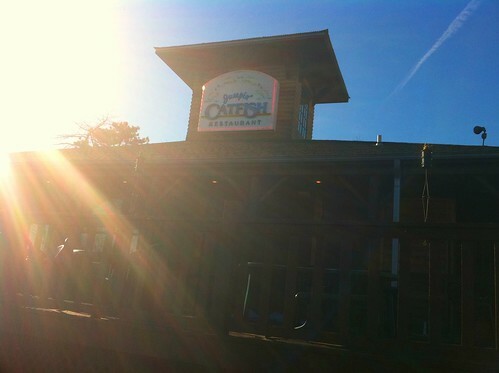 From the outside, Jumpin’ Catfish looks like a pure chain restaurant. The large, faux-log cabin structure sits back from the street just off the exit ramp, with a large wooden deck and an unremarkable light-up sign adorning the front of the cupola. I almost changed my mind and left but thought it might at least be entertaining to have a meal there after all. 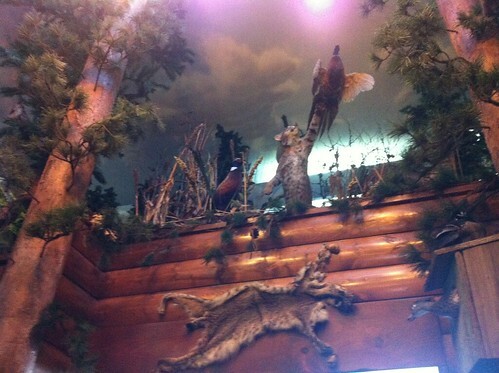 The wacky interior, littered with taxidermied animals, photos of hunters and their prey, wood paneling and glassed-in displays of animals in their natural habitats create a novel if somewhat cheesy ambiance, likely to appeal to outdoorsmen and others easily persuaded by decorative extremism. While Jumpin’ Catfish is a locally owned establishment with only three locations, it has all the visual appeal of a well-conceived national chain restaurant of previous decades. The carpet is a dull 90’s plaid and the booths, despite a subtle outdoor theme, would be at home in any Shoney’s or lowbrow fishing resort restaurant. Servers here are compelled to wear fishing vests and khaki shorts which is kind of lame, but I understand the thematic aspect. Televisions are sprinkled throughout the place but thankfully have the sound turned off. Instead, a local radio station plays overhead which was only slightly better, considering everyone in the joint has to listen to the obnoxious commercials. On to the food. 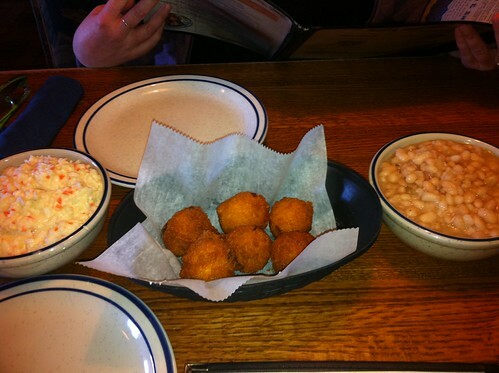 The gimmick at Jumpin’ Catfish is the side dishes which are immediately brought to your table in medium sized bowls–even before your drink order is taken: freshly fried hushpuppies, creamy chopped cole slaw and white beans with ham. Presumably diners should jump right in and start eating but I would have preferred the sides to come out with my entree. I guess it was nice to have something to much on right away. The menu is huge, offering a variety of catfish preparations, including cajun, creamy parmesan and lemon pepper treatments. 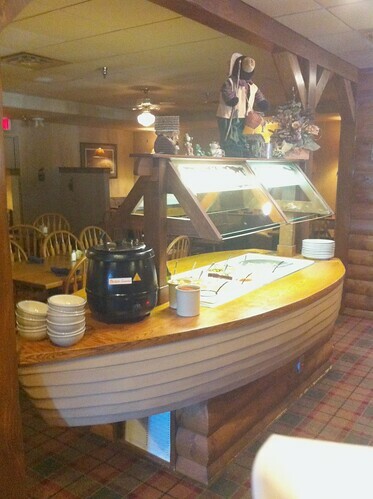 You can also order boiled shrimp, fried chicken, fried oysters and a number of game selections like quail and elk steaks. The lunch menu includes smaller portions most items. Prices vary, but you can count on spending about 9 bucks for your food. So how is the food? Pretty bad actually. My cajun-style catfish was overcooked, lending it a rubbery consistency. Whatever spice blend they used was burnt and tasted that way. The art of “blackening” is not a technique that can be applied to all spice mixtures and this was a major failure. The fried catfish was not overcooked but was exceedingly bland and very, very greasy. Speaking of bland the side dishes have no business being this place’s claim to fame. I was excited for the white beans with ham but found the dish had virtually no seasoning. The bowl contained about 4 cubes of deli-style ham, a choice that caused virtually no ham flavor to be imparted to the beans. A liberal application of salt and pepper at the table improved the dish dramatically. The hush puppies were dense and dry, even right out of the fryer. They also had an odd, bitter aftertaste which may have been the leavening agents or old cooking oil. The cole slaw was a very good, classic variety: cold, tangy, creamy and a little sweet. The potato wedges are probably the best option for a side dish, despite the fact that they come without salt or any seasoning. The mashed potatoes are seemingly a mixture of real taters and reconstituted flakes. Both flavors were present and that’s the only conclusion I can reach about them. Really the best part of the visit was the service, about which I have zero complaints. Our server checked on us at the appropriate times, delivered quick and copious refills, got the check out in a timely fashion and generally did her job well. I sort of understand the appeal of this place for the many people who have nothing in common with me. But I’ll take good food over decor any day. I ate there three years ago or so, and had exactly the same experience. Burnt tasting food, nice servers. It seems likely your dinner was not a one-time "off day" for them. I am not a fan of "down home" type restaurants, I find that type of food tastes better at home, shocker of all shockers! 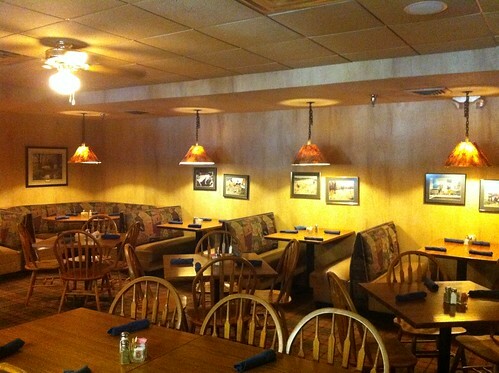 I have been tempted to try the location in Olathe, but haven't run out of other options that I think sound better. I was curious about this place…glad you suffered through it so that I didn't have to. 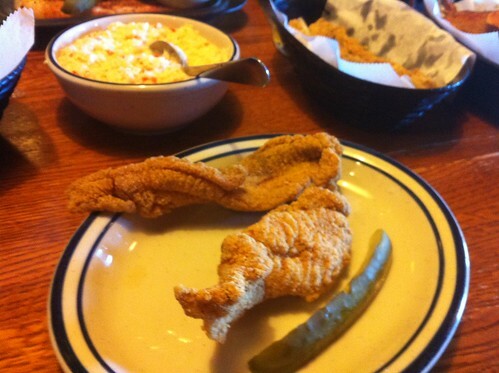 My curiousity was due to my familiarity with a southern chain by the name of Catfish King (or David Beard's Catfish King) – if you ever get the occasion, perhaps it could erase "Jumpin' Catfish" from your memory. I drove past here recently. From the highway, it appears to be boarded up, closed. There is a reason the restaurant is closed. The owner of these restaurants has worked for 25 years to keep the good reputation he built and the NKC location did not meet his standards. 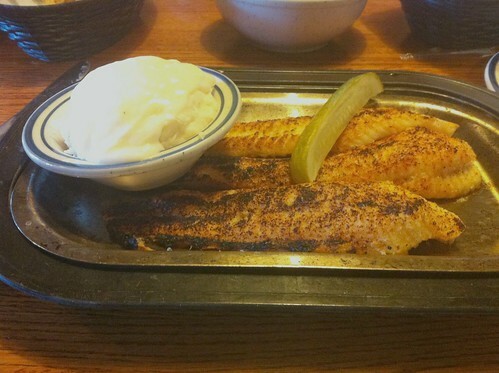 The food at the Olathe Jumpin' Catfish is always hot, delicious and reasonably priced and the service is excellent. I would hope you would all try the Olathe location and give him a chance to redeem his reputation during these trying times. I can assure you, you will walk away with a different appreciation of Jumpin' Catfish restaurants! Try Olathe!! It's worth it! Good to know, thanks Buzzy.